Peroxisomes are cytoplasmic organelles. De-Duve and co-workers isolated peroxisome from liver cells and some other tissues. They are present in both animals and plants. They are also found in protozoa, yeast and many types of cells of higher plant. Peroxisomes are enclosed in a single membrane. Their size is 0.5 μm in diameter. In some mammalian tissues peroxisomes form an extensive reticulum (network). They contain more than 50 enzymes. Peroxisomes self-replicate by enlarging and then dividing. They contain H2O2 – producing enzymes like oxidases and catalases. They also contain some oxidative enzymes like peroxidase, catalase, glycolic acid oxidase and some other enzymes. Proteins are selectively imported into peroxisomes. Peroxisome contains no DNA or ribosomes. Peroxisome contains no DNA or ribosomes. Therefore, they have no means of producing proteins. Thus, all of their proteins are imported across the membrane. Peroxisomes are involved in the formation and decomposition of hydrogen peroxide (H2O2). 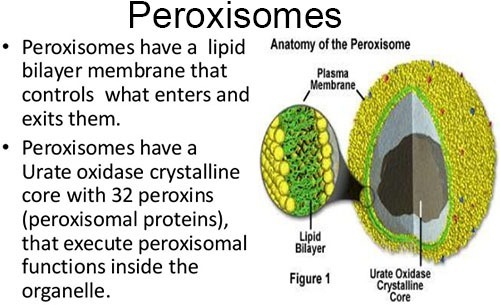 The word peroxisome is derived from hydrogen peroxide. Peroxisomes contain oxidative enzymes such as catalase, D-amino acid oxidase and uric acid oxidase. They use molecular oxygen to remove hydrogen atoms from specific organic substrates (R) in an oxidative reaction. It produces hydrogen peroxide (H2O2) which is a toxic byproduct of cellular metabolism. Peroxisomes are important for lipid metabolism. In humans, oxidation of fatty acids greater than 18 carbons in length occurs in peroxisomes. 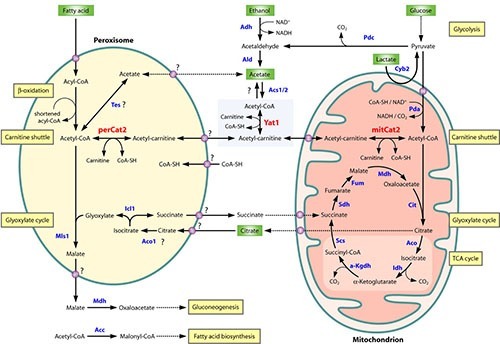 In yeast, all fatty acid oxidation occurs in peroxisomes. A major function of the peroxisome is the breakdown of fatty acid molecules in a process called beta-oxidation. In this process, the fatty acids are broken down in to Acetyl-CoA. It is then transported back to the cytosol for further use. 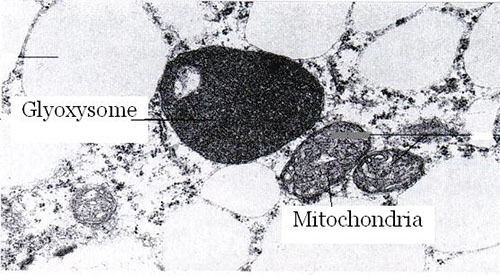 Peroxisomes contain the first two enzymes required for the synthesis of plasmalogens (myelin sheath). Peroxisomes also play important roles in cholesterol and bile acid synthesis, purine and polyamine catabolism and prostaglandin metabolism. Glyoxisomes are cytoplasmic organelles. These are present only in plant cells. These are most abundant in plant seedings. Glyoxisomes are present only for short period of germination of seed. These are present in lipid-rich seeds like castor oil and soybeans. These are absent in lipid-poor seed like pea. These are membranous bound organelles. They contain enzymes like glycolic acid oxidase, catalase and number of other enzymes. These enzymes are not present in animal cells. The germinating plant or seedling depends on stored fatty acids of seed for obtaining energy. These germinating seedlings convert the stored fatty acid in to carbohydrates. It is one of the primary activities of seed during germination. This conversion takes place through a cycle called glyoxylate cycle. The enzymes of this cycle are present in Glyoxisomes. 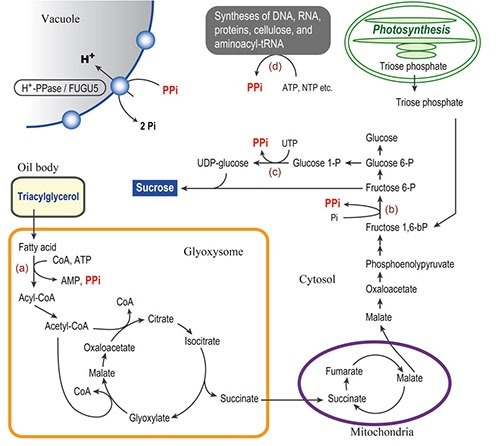 Glyoxisomes play an important role in both catabolic and anabolic pathways in plants. Glyoxisome break the fatty acid into succinate in lipid-rich seeds like castor bean.